Hampton Court Palace, just outside London, is one of Britain’s most important historic houses. It’s best known as the preferred palace of King Henry VIII and his various wives but has served many Kings and Queens over the years. The palace has various sections with a number of extensions and changes having taken place to suit each Monarch. The most interesting part for many visitors is the Tudor part of the palace which still retains its great hall, bedrooms and a chapel. Look out also for the impressive chimney stacks which cover the roof-line. The audio tour will also point out some of the legacy of Anne Boleyn which wasn’t destroyed after her execution. The newer parts of of the palace are much more opulent and grand, but the rooms are similar to many you will have seen in royal apartments in historic houses around Europe. They’re still well worth seeing though and a particular highlight is the royal toilet! A visit to the whole palace will take several hours as it’s absolutely huge. You also see the kitchens, other service areas and the magnificent gardens. On a beautiful day, you can spend a long time just walking around them as they stretch down to the river on one side and towards a deer park on the other. In one greenhouse you’ll find a record-breaking vine and don’t miss the cosy building in the gardens which overlooks the river as it has beautifully painted walls. One thing we didn’t like was the audio tour. There are a number to choose from, but we found all the adult ones to be long-winded and tedious. Most of the time we ended up stopping them and speeding on to the commentary for the next room. One of the things we really liked was the areas outside the palace which are free. The Vegetable Garden, Rose Garden and River Walk were all lovely and should not be missed. 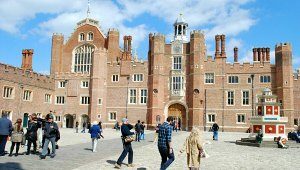 Hampton Court Palace is located on the River Thames, 35 minutes from London by train from Waterloo Station. You can also use the tube, but bear in mind that the Hampton Court station is in Zone 6.